Plasma membrane is an extremely thin line making it very difficult to study. The major problem is the separation of membrane from the pool of organelles scattered in the cytoplasm. After a long expedition, the ideal candidate for the study of plasma membrane was found to be red blood cells. RBC is exclusively designed for oxygen transport. RBCs are readily available and inexpensive to isolate. 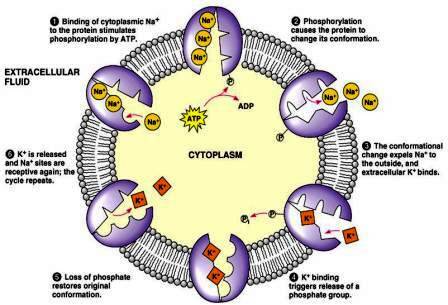 It lacks nucleus and other organelles making it the best model system for studies of membrane structure. Plasma membrane of RBCs can be easily isolated from other membranes and cellular components. How to isolate PM from RBCs? Intact erythrocytes plasma membrane can be obtained by placing the cells in a dilute (hypotonic) salt solution. The cells respond to this osmotic shock by taking up water and swelling, a phenomenon termed hemolysis. Fractionation of membrane proteins can be accomplished using polyacrylamide gel electrophoresis (PAGE) in the presence of the ionic detergent SDS (Sodium Dodecyl Sulphate). The most abundant integral proteins of this membrane are a pair of carbohydrate containing membrane spanning protein, called band 3 and glycophorin A. Glycophorin A was the first integral protein sequenced and consists of 131 amino acids. Plasma membrane the entry gate! Plasma membrane is semi permeable. Which are the ones that are allowed to pass through? Some molecules like water, gases (O2, CO2, N2) and small uncharged polar molecules like urea, ethanol can pass directly through the bilayer without any checking. How transport occurs across PM for other molecules? Molecules like large uncharged polar molecules, sugars, ions (Na+, K+, Cl-, Ca2+) and charged polar molecules like amino acids, ATP, Glucose 6-Phosphate require the presence of intergral membrane transport proteins. These are the channels or subways that span the membrane and designed for the transport of specific molecules. Which are the ways by which material transport occurs across plasma membrane? The transport of materials involves two types of mechanisms, viz., passive transport and active transport. Passive Transport requires neither energy nor energy expenditure of the cell. It occurs by three processes, viz., diffusion, facilitated diffusion, and osmosis. The spontaneous process in which a substance (gas or liquid) moves from an area of higher concentration of one of lower concentration, eventually reaching the same concentration in all areas. Only relatively small uncharged or hydrophobic molecules (H2O, O2, CO2, other gases urea, ethanol) cross the lipid bilayer by simple diffusion. No membrane proteins are involved, so there is no specificity. It is the transport of various metabolities (e.g., glucose) along the concentration gradient with the help of carrier protein. The molecule binds to the proteins on one side of the membrane, the protein undergoes a conformational change, transports the molecule across the membrane and then release it on the other side. An example of Facilitated diffusion is the uptake of glucose into erythrocytes by the glucose transporter. It is the process of movement of the solvent (water) molecules from a region of low solute concentration to a region of high solute concentration across a semi permeable membrane. Tonicity is a term used to refer the external osmotic environment of a cell. The solutions outside the cell can be of three types base upon the relative concentration of water and solutes viz., isotonic, hypotonic, and hypertonic. 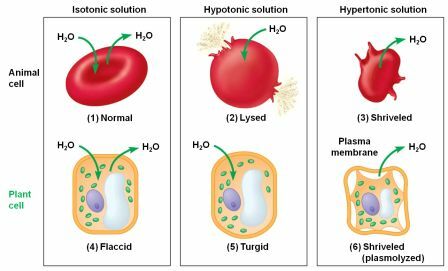 Isotonic solution: If the concentration of solutes of a solution is same that of the intracellular fluid (cytoplasm and cell sap) it is called Isotonic solution. If the cell is placed in such a solution , there is no net movements of water molecules across the cell membrane. 0.9% NaCl2 and 5% glucose are isotonic for human RBC. Solutions that have lower solute concentration than that of intracellular fluids are called hypotonic solutions.0.2% NaCl solution is the hypotonic solution to human RBC. When the animal cell is placed in hypotonic solution water enters into the cell by endosmosis which finally causes the rupture of the cell. This is because the cell membrane cannot withstand the pressure exerted by the cell contents when swollen. The solution that has higher solute concentration than that of intracellular fluid is called hypertonic solution. 2.1% NaCl is hypertonic solution for human RBC. If a cell is placed in a hypertonic solution it starts losing water by exosmosis. In RBC it results in a shrunken appearance .Plant cells when placed in hypertonic solution; the cytoplasm along with plasma membrane withdraws from the cell wall because of the outflow of water from the vacuole due to exosmosis. The process is called plasmolysis. The process of movement of substances from a lower concentration to a higher concentration (i,e. 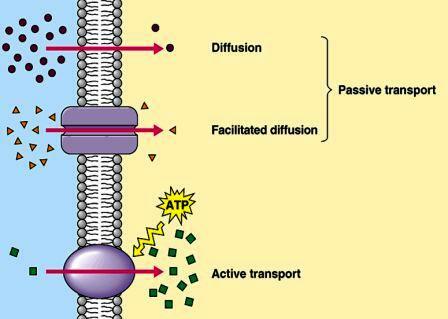 against a concentration gradient ) through a cell membrane with the help of a carrier molecule like permease using energy is called active transport. Energy is obtained from ATP molecules. It occurs in muscle cells, nerve cells and kidney cells etc. Sodium -potassium pump is an example of active transport, maintains the gradient of sodium (Na+) and potassium ions (K+) across the membrane. Typically, animal cells have higher concentrations of K+ and lower concentrations of Na+ inside the cell. Sodium-potassium pump uses the energy of one ATP to pump three Na+ ions out and two K+ ions in against the gradient. Active transport helps the rapid and selective intake of many nutrients by cells. It enables to maintain ionic and water balance between cells and extracellular fluid. It maintains the membrane potential by keeping the inner side of the membrane relatively electronegative to its outer side.